The idea of race refers to superficial physical differences that a particular society considers significant. Phenotype refers to the composite observable traits and behaviors of an individual or group. Geneotype refers to a person’s genetic makeup. Among humans, race has no taxonomic significance — all living humans belong to the same hominid subspecies, Homo sapiens sapiens. An ” ideology of race,” formed through the merging of folk beliefs about group differences with scientific explanations of those differences, argued that races are primordial, natural, enduring and distinct. ideology of race: The belief that races are primordial, natural, enduring, and distinct, derived from folk beliefs and scientific explanations generated during the 17th-19th centuries. race: A large group of people distinguished from others on the basis of a common heritage or common physical characteristics, such as skin color and hair type. phenotype: Any observable characteristic of an organism, such as its morphological, developmental, biochemical or physiological properties, or its behavior. While many people conflate the terms “race” and ” ethnicity,” these terms have distinct meanings for sociologists. The idea of race refers to superficial physical differences that a particular society considers significant, while ethnicity is a term that describes shared culture. Historically, the concept of race has changed across cultures and eras. Race has been used as a classification system to categorize humans in a variety of ways: as large and distinct populations, as groups distinguished by phenotype (observable traits and behaviors), and as groups of differing geographic ancestry and ethnicity. In the past, theorists have posited categories of race based on various geographic regions, ethnicities, skin colors, and more. Their labels for racial groups have connoted regions (Mongolia and the Caucus Mountains, for instance) or denoted skin tones (black, white, yellow, and red, for example). It was assumed for centuries that race was based in biology and genetically distinguishable among different subgroups (e.g., African Americans, Caucasians, American Indians, etc.). However, this typology of race developed during early racial science has fallen into disuse; over time the concept has become less connected with ancestral and family ties and more concerned with superficial physical characteristics. While biologists sometimes use the concept of race to make distinctions among sets of traits, others in the scientific community suggest that this idea of race is often used in a naive or simplistic way. Now, race is far more widely accepted to be a social construction and therefore not distinguishable based on biology alone. Among humans, race has no taxonomic significance — all living humans belong to the same hominid subspecies Homo sapiens sapiens. Social conceptions and groupings of races vary over time, according to different folk taxonomies that define essential types of individuals based on perceived traits. Many scientists consider this sort of biological essentialism obsolete, and generally discourage racial explanations in favor of other physical or behavioral distinctions. The word “race” was originally used to refer to any nation or ethnic group. For example, the 13th century traveler Marco Polo used the term “Persian race”, to describe people inhabiting the territory of the nation-state Iran. However, anthropologists only trace the current concept of “race,” along with many of the ideas now associated with the term, to the 16th and 17th centuries and the time of the Scientific Revolution. This era was one of European imperialism and colonization, during which new – often exploitive – political relations were established between Europeans and other cultures of the world. As Europeans encountered people from different parts of the world, they speculated about the physical, social, and cultural differences among various human groups. As Europeans began to sort themselves and others into groups based on physical appearance, they attributed to individual members of these groups certain behaviors and capacities that were supposedly deeply ingrained. These supposed physical, intellectual, behavioral, and moral differences soon became part of common folk belief. From the 17th through the 19th centuries, the merging of folk beliefs about and scientific explanations of group differences produced what social anthropologist Audrey Smedley has called an “ideology of race. ” According to this ideology, races are primordial, natural, enduring and distinct. During this time, it was further argued that some groups may be the result of mixture between formerly distinct populations, but that careful study could distinguish the ancestral races that had combined. Contemporary conceptions of race illuminate how far removed modern race understanding is from biological qualities. In modern society, some people who consider themselves “white” actually have more melanin (a pigment that determines skin color) in their skin than other people who identify as “black. ” In some countries, such as Brazil, class is more important than skin color in determining racial categorization. People with high levels of melanin in their skin may consider themselves “white” if they enjoy a middle-class lifestyle. On the other hand, someone with low levels of melanin in their skin might be assigned the identity of “black” if they have little education or money. While race is largely understood to be a social construct, most scholars agree that race has real material effects in the lives of people through institutionalized practices of preference and discrimination. Socioeconomic factors, in combination with early but enduring views of race, have led to considerable suffering within disadvantaged racial groups. Racial discrimination often coincides with racist mindsets, whereby the individuals and ideologies of one group come to perceive the members of an outgroups as both racially defined and morally inferior. As a result, racial groups possessing relatively little power often find themselves excluded or oppressed. Racism today continues to contribute to the suffering of many people in the form of slavery, genocide, systemic oppression, and institutionalized discrimination. Law enforcement officers often utilize race to profile suspects, a term commonly referred to as “racial profiling”. This use of racial categories is frequently criticized for perpetuating an outmoded understanding of human biological variation, and promoting stereotypes. Racial groups are sociologically, rather than biologically, different; that is to say, there is no “race” gene or set of genes. Genetic studies reveal that the existence of geographic ancestral origin is more valid than a claim that socially-defined categories of races each have a distinct biological basis. While a person’s race can generally be visually determined, different racial groups do not in fact differ biologically in substantial ways. The significance of race is social, meaning that defining race in in biological terms is a product of cultural socialization. endogamy: The practice of marrying or being required to marry within one’s own ethnic, religious, or social group. allele: One of a number of alternative forms of the same gene occupying a given position on a chromosome. People’s understanding of “race” emerged long before we knew anything about genetics. There are very few biological differences between the races and there is no “race” gene or set of genes to speak of. The relationship between race and genetics has relevance for the ongoing controversies regarding race. Ongoing genetic research has investigated how ancestral human populations migrated in the ancestral geographic environment into different geographic areas. Today it is possible to determine, by genetic analysis, the geographic ancestry of a person and the degree of ancestry from each region. Such analysis can pinpoint the migrational history of a person’s ancestors with a high degree of accuracy. Often, due to practices of group endogamy, allele frequencies cluster locally around kin groups and lineages, or by national, cultural, or linguistic boundaries – giving a detailed degree of correlation between genetic clusters and population groups when considering many alleles simultaneously. Recent discoveries in genetics offer a means of categorizing race which is distinct from past methods, which were often based on very broad criteria corresponding to physical characteristics, such as skin color, and which do not correlate reliably with geographic ancestry. Some anthropologists, particularly those working with forensics, consider race to be a useful biological category as it is often possible to determine the racial category of a person by examining physical remains, although what is actually being identified is the geographical phenotype. While a person’s race can generally be visually determined, different racial groups do not in fact differ biologically in substantial ways. In a December, 2003, Scientific American article, Bamshad and Olson, two geneticists working on mapping the human genome, concluded that “race” does not exist genetically. Rather, race is a social construct and a product of culture, not biology. Many governments provide legal definitions of race for purposes of census-taking and calculating budgets for governmental programs. The use of ” race ” as a broad, non-scientific description of general appearance is a common practice in law enforcement agencies around the world. Racial profiling refers to the use of an individual’s race or ethnicity by law enforcement personnel as a key factor in determining whether to engage in enforcement (e.g., make a traffic stop or arrest). The practice is controversial and is illegal in some nations. In an attempt to facilitate the job of law enforcement officers, the FBI employs the term “race” to summarize the general appearance of individuals whom they are attempting to apprehend. racial profiling: Racial profiling refers to the use of an individual’s race or ethnicity by law enforcement personnel as a key factor in deciding whether to engage in enforcement (e.g., make a traffic stop or arrest). Many governments provide legal definitions of race for purposes of census-taking and calculating budgets for governmental programs such as those that promote equal opportunity employment. For instance, in the U.S. Federal Office of Management and Budget (OMB) and the U.S. Census Bureau currently uses race and ethnicity as self-identification data items. In this system, the residents choose the race or races with which they most closely identify and indicate what their ethnic origin is (e.g., Latino). The racial categories represent a social-political construct for the race or races that respondents consider themselves to be. OMB defines the concept of race as outlined for the U.S. census as not “scientific or anthropological” and takes into account “social and cultural characteristics as well as ancestry”, using “appropriate scientific methodologies” that are not “primarily biological or genetic in reference. ” The race categories include both racial and national-origin groups. 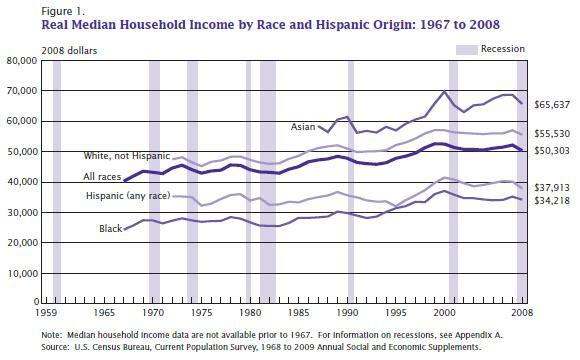 Governmental Use of Racial Categories: This image illustrates U.S. real median household income per year by race and ethnicity from 1967 to 2008, as compiled by the U.S. Census Bureau. In an attempt to provide general descriptions that may facilitate the job of law enforcement officers seeking to apprehend suspects, the FBI employs the term “race” to summarize the general appearance (skin color, hair texture, eye shape, and other such easily noticed characteristics) of individuals whom they are attempting to apprehend. From the perspective of law enforcement officers, it is generally more important to arrive at a description that will readily suggest the general appearance of an individual than to make a scientifically valid categorization by DNA or other such means. Thus, in addition to assigning a wanted individual to a racial category, such a description will include: height, weight, eye color, scars, and other distinguishing characteristics. British Police use a classification based on the ethnic background of British society, for example W1 (White-British), M1 (White and black Caribbean), and A1 (Asian-Indian). Some of the characteristics that constitute these groupings are biological and some are learned (cultural or linguistic) traits that are easy to notice. Racial profiling refers to the use of an individual’s race or ethnicity by law enforcement personnel as a key factor in deciding whether to engage in enforcement (e.g. make a traffic stop or arrest). The practice is controversial and is illegal in some nations. In the United States, the practice of racial profiling has been ruled to be both unconstitutional and a violation of civil rights. There is active debate regarding the cause of a marked correlation between the recorded crimes, punishments meted out, and the country’s populations. Many consider de facto racial profiling an example of institutional racism in law enforcement. The history of misuse of racial categories to impact adversely one or more groups and to offer protection and advantage to another has a clear impact on the larger debate. This debate is concerned with the legitimacy of the government using known phenotypical or genotypical characteristics tied to the presumed race of both victims and perpetrators. Most social scientists and biologists believe race is a social construct affecting sociopolitical, legal, and economic contexts. A social construct refers to something that does not have a basis in the natural world but is an artificial distinction created by humans. Some researchers now conceptualize and analyze human variation in terms of populations, dismissing racial classifications altogether. Many social scientists have replaced the word ” race ” with the word ” ethnicity ” to refer to groups that self-identify based on shared religion, nationality, or culture. Ethnicity refers to groups that self-identify based on shared beliefs, culture, ancestry, and history. population: A count of the number of residents within a political or geographical boundary, such as a town, a nation, or the world or of the number of individuals belonging to a particular group. ethnicity: The identity of a group of people having common racial, national, religious, or cultural origins. social construct: Social constructs are generally understood to be the by-products of countless human choices rather than laws resulting from divine will or nature. Debates continue in and among academic disciplines as to how race should be understood. Most social scientists and biologists believe race is a social construct, meaning it does not have a basis in the natural world but is simply an artificial distinction created by humans. As a result of this understanding, some researchers have turned from conceptualizing and analyzing human variation by race to doing so in terms of populations, dismissing racial classifications altogether. In the face of the increasing rejection of race as a valid classification scheme, many social scientists have replaced the word race with the word “ethnicity” to refer to self-identifying groups based on shared religion, nationality, or culture. Following the World War II, alongside empirical and conceptual problems with “race,” evolutionary and social scientists were acutely aware of how beliefs about race had been used to justify discrimination, apartheid, slavery, and genocide. This questioning gained momentum in the 1960s during the United States ‘ civil rights movement and the emergence of numerous anti-colonial movements worldwide. Many academics and researchers across disciplines, therefore, came to the conclusion that race itself is a social construct. As anthropologists and other evolutionary scientists have shifted away from the language of race to the term “population” to talk about genetic differences, historians, cultural anthropologists and other social scientists have accordingly re-conceptualized the term “race” as exclusively a cultural category or social construct. Many social scientists have also replaced the word race with the word “ethnicity” to refer to self-identifying groups based on beliefs concerning shared culture, ancestry and history. The social construction of race has developed within various legal, economic, and sociopolitical contexts, and may be the effect, rather than the cause of major race-related issues. While race is understood to be a social construct by many, most scholars agree that race has real, material effects in housing discrimination, in the legal process, in policing practices, in education, and many other domains of society. Sociologists Omi and Winant’s theories of racial formation describe how “race is a concept which signifies and symbolizes social conflicts and interests by referring to different types of human bodies. ” The meanings and implications of race are produced and invested in by social institutions, as well as through cultural representations. 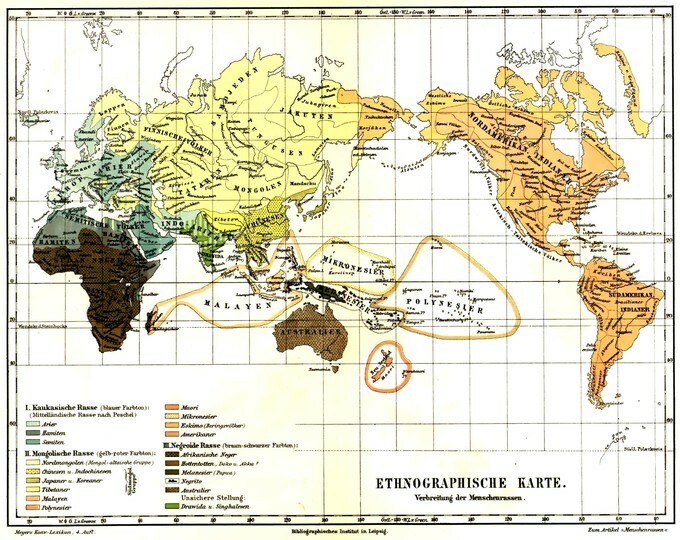 Example of an early modern attempt at racial categorization: This map depicts the three great races, according to Meyers Konversationslexikon, of 1885-90. The subtypes of the Mongoloid race are shown in yellow and orange tones, those of the Europid race in light and medium grayish green-cyan tones, and those of the Negroid race in brown tones. Dravidians and Sinhalese are in olive green, and their classification is described as uncertain. The Mongoloid race sees the widest geographic distribution, including all of the Americas, North Asia, East Asia, Southeast Asia, and the entire inhabited Arctic. Racism is the belief that different traits of racial groups are inherent and justify discrimination. Racism may be expressed individually and consciously, through explicit thoughts, feelings, or acts, or socially and unconsciously, through institutions that promote inequality between races. Individual-level racism is seen in prejudice, bias, or discrimination displayed between two or more people. Structural racism refers to inequalities built into an organization or system. Historical economic or social disparity caused by racism can adversely affect present generations. Racial profiling involves the singling out of individuals based upon their race for differential treatment, often in the form of increased surveillance or enforcement by the criminal justice system. Color-blind racism involves the avoidance of racial language as a means to suggest that racism is no longer an issue when it actually is. Genocide refers to the attempt to completely destroy a racial or ethnic group, usual perpetrated by a dominant racial group against a persecuted one. Structural Racism: Unequal practices built into organizations or institutional systems that disproportionately benefit or disadvantage particular racial groups. Cultural Racism: A variation of structural racism that occurs when the assumption of the inferiority of one or more races is embraced by the culture of a given society. Racism is the belief that different inherent traits in racial groups justify discrimination. In the modern English language, the term “racism” is used predominantly as a pejorative epithet. It is applied especially to the practice or advocacy of racial discrimination of a pernicious nature, which is often justified by recourse to racial stereotyping or pseudo-science. Race is the primary determinant of human capacities (prejudice or bias). A certain race is inherently superior or inferior to others (prejudice or bias). Individuals should be treated differently according to their racial classification (prejudice or bias). Racism may be expressed individually and consciously, through explicit thoughts, feelings, or acts, or socially and unconsciously, through institutions that promote inequalities among races. Individual-level racism is prejudice, bias, or discrimination displayed in an interaction between two or more people. An example of individual-level racism would be an employer firing someone because of his/her race, without regard to their skills or qualifications as an employee. Children develop an awareness of race and racial stereotypes quite young (between the ages of 5 and 11), and these racial stereotypes affect behavior. For example, children who identify with a racial minority that is stereotyped as not doing well in school tend to perform worse academically when they learn about the stereotype associated with their race. Structural racism refers to inequalities built into an organization or system. An example of structural racism can be seen in recent research on workplace discrimination. There is widespread discrimination against job applicants whose names were merely perceived as “sounding black. ” These applicants were 50 percent less likely than candidates perceived as having “white-sounding names” to receive callbacks for interviews, no matter what their level of previous experience was. The researchers view these results as strong evidence of unconscious biases rooted in the country’s long history of discrimination. This is an example of structural racism as it shows a widespread established belief system that treats people differently based upon their race. Additional examples of structural racism include apartheid in South Africa, the system of Jim Crow laws in the U.S., and the inequitable lending practices of banks (i.e., redlining). Cultural racial discrimination, a variation of structural racism, occurs when the assumption of inferiority of one or more races is built into the a society ‘s cultural norms. Racism is an expression of culture, passed on through enculturation and socialization. Historical economic or social disparity caused by past racism affects the present generation of the victimized group. For example, racial deficits still exist in formal education, and unconscious racist attitudes still exist against certain members of the general population. This perspective seeks to explain how, for example, African Americans in the U.S. have had their opportunities in life adversely affected due to the enslavement of their ancestors. Disparities in wealth, net worth, and education lend credence to this idea. One response to racial disparity in the U.S. has been affirmative action. Affirmative action is the practice of favoring or benefiting members of a particular race in areas such as college admissions and workplace advancement, in an attempt to create atmospheres of racial diversity and racial equality. Though lauded by many as a boon to society, giving the less privileged a chance at success and working to overcome historical social disparity, the practice is condemned as racially discriminatory by others. 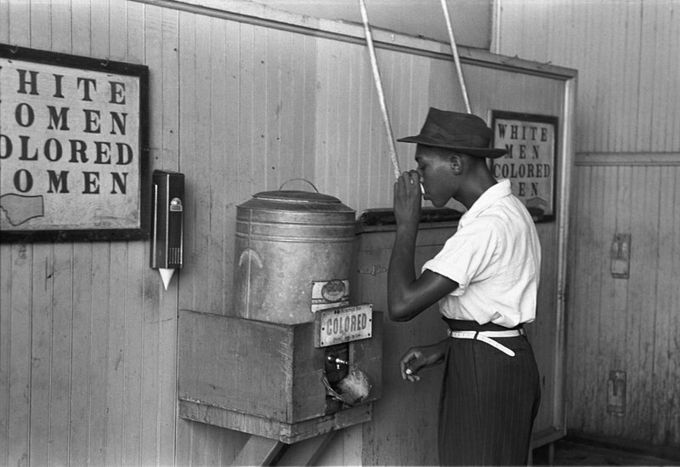 Segregation as a Form of Racism: A “colored” drinking fountain from mid-20th century.